The anode rod is an important piece of your water heater that should be replaced every 3 years or so. Of the many parts and components used in modern water heaters, the anode rod might just be one of the most important. Without this piece, the internals of water heaters would wear down a lot more quickly than they do now. However, anode rods need to be replaced every so often because they wear out faster than the lifespan of the water heater. If you have a standard tank-style heater (as opposed to a tankless model), you need to check the rod every so often and replace it as necessary. Here is some more information about what an anode rod does. Water heaters are susceptible to rust and corrosion because of the materials used to construct them and how these materials react to water. Water is naturally acidic, and the steel used to make the tanks undergoes the rusting and corroding process when it comes in contact with oxygen or moisture. The heating aspect may make your water nice and hot, but this heat speeds up the corrosion process. The anode rod is a piece designed to slow down corrosion and rusting in water heaters. The rod is made of magnesium, which wears out faster than steel. When water corrodes the magnesium, the anode rod releases electrons into the tank which form a protective barrier around the steel of the tank. The service life of an anode rod can vary depending on the temperature of the water in the tank, how much water is used, the quality of the water heater, and the composition (hardness vs. softness) of the water. 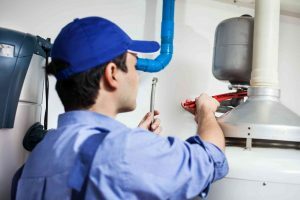 Keeping up with your regular water heater maintenance will help extend the life of the rod as well as the whole system. Have your tank flushed once a year to remove the sediment. The anode rod ought to be replaced once every three years, but it is a difficult process to do yourself owing to its position on the tank. So make sure you give your local professional plumber a call when it comes time to replacing this critical piece of your water heater! This entry was posted on Thursday, January 26th, 2017 at 7:53 pm. Both comments and pings are currently closed.